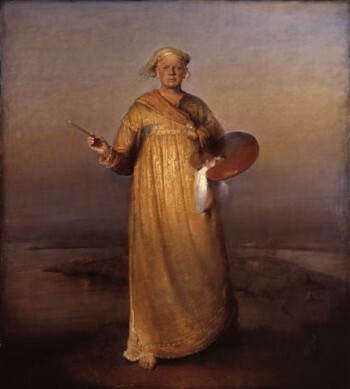 Odd Nerdrum is one of Norway’s most internationally known contemporary artists but now he faces heavy fines and a prison term for alleged tax evasion. He’s had to appear in court in Oslo this week, where prosecutors suggested his financing has been as creative as his paintings. Odd Nerdrum refuses to have his picture taken and has boycotted Norwegian media for years. No photos were allowed during his court appearance in Oslo this week, but this self-portrait has been available for press use on his website. The artist, whose works have been compared to those of Rembrandt and collected by the likes of rock star David Bowie, claims he set the money aside as a sort of “crisis fund” to cover possible compensation claims after some of the paint on works he’d created in the late 1980s literally seemed to melt when subjected to heat. Nerdrum claims he’d used a special mixture of oils and paint in an effort to recreate the style of the old masters, but his customers complained when their artworks later showed signs of trickling paint. Newspaper Dagens Næringsliv (DN) reported that Nerdrum called the problem “a great shame and downturn for me.” In an effort to save his reputation, he painted several of the works again but other customers wanted their money back. That’s why he set aside cash, he claimed, to pay eventual claims. Norwegian tax authorities have charged him with failing to report the cash on his Norwegian tax returns, part of more than NOK 14 million worth of allegedly undeclared income and personal fortune accumulated through sales of his paintings between 1998 and 2002. In addition to as much as USD 900,000 (NOK 5 million) in cash that he placed in the Austrian bank box, prosecutors claim the other NOK 9 million is based on checks and bank account statements acquired by the tax authorities with the help of tax authorities in the US, where Nerdrum has long had a large customer base. Nerdrum was indicted earlier this year and faces a fine as high as NOK 8 million and a prison term of up to one year. Nerdrum’s defense attorney Tor Erling Staff told the court that Nerdrum suffers from Tourettes Syndrome. Nerdrum claims he has mastered its physical afflictions but that his head is affected by the neurological condition. Although tax evasion charges are taken seriously in Norway, Nerdrum has his supporters and sympathizers including around 30 friends and former pupils who have mounted a special exhibit of their best works to hail the influence Nerdrum has had on Norwegian art. “We want to show what he has meant for a group of young artists,” Irena Jovic, project leader for the exhibit at Tjuvholmen in Oslo, told newspaper Dagsavisen this week. She noted that Nerdrum has allowed many young artists to work with him over the years for no fees.